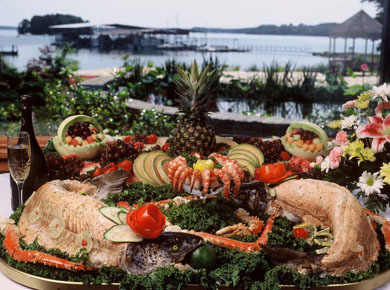 With spectacular views of Lake Hartwell, our facility offers a variety of rooms to accommodate your special occasion. The Galley Restaurant offers two private dining rooms. The upstairs private dining room accommodates 150 people for seated service and 200 people for a standing reception. The dining room is 40 ft x 70 ft (2800 ft²) with a full panoramic waterfront view. The Galley’s downstairs private dining room seats up to 40 people with an adjoining covered patio. If you’re planning an outdoor event, the Galley can accommodate up to 500 people on its open air courtyard and lawn. Please contact our Special Events Coordinator, Dawn Falkowski, at (864) 287-3215 or 864-353-1365 (mobile) to set up an appointment or to book your special function.